STEM (science, technology, engineering, and math) is one of the fastest growing industries in the United States, which has caused many parents in the Bay Area to foster their children’s interest in these pursuits at an early age. Just a short trip away from the luxury Oakland apartments rests the Chabot Space and Science Center, an excellent location for kids and adults alike to learn more about STEM. If you’re ready for an educational fieldtrip complete with playing astronaut and learning about the cosmos interactively, then it’s important to plan your trip in advance to get the most out of Chabot. Here’s what you need to know. Chabot is a working observatory featuring three telescopes, which means the bulk of the center’s exhibits center around space and the science that surrounds it. Exhibits offer keen insight into what it takes for astronauts to explore space as well as how the cosmos work. You’ll find Destination Universe on the main floor, which gives children the opportunity to conduct unique space-inspired experiments. Simulations allow them to manipulate the heat of a star to change its color, while physical components include a “black hole” they can climb through as well as a lighted floor filled with colorful stars. Head upstairs and you’ll find numerous interactive activities that provide incredible insights into space travel. You can view how astronauts survive in space, see what they eat, and better understand how they move around in zero gravity. Older children can use the various machines that simulate exercise astronauts perform to stay in shape while in orbit. There are also models of equipment on the space shuttle, stars and their functions, and other neat space facts. Parents and children also have the opportunity to climb into a space capsule and have their phot taken with “real” astronaut and make craters using a unique pinball machine and sand. With so many activities involved, it’s best to separate them by interest and age group. It is possible to see everything in one day, but spending too much time in one area could cause you to miss out on some of the fun. 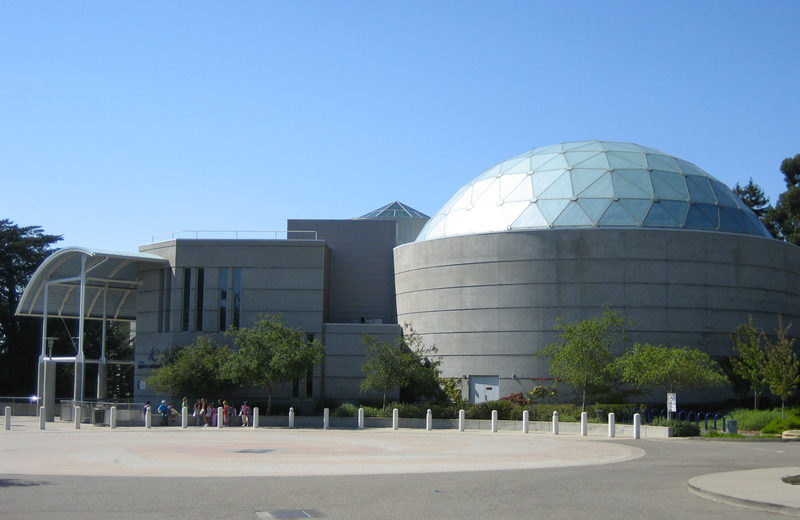 Chabot features an enormous dome-screened planetarium that plays 20 to 30-minute shows at a time. They e=feature different shows for varying ages, which allows parents in the Bay Area with different aged children to find something everyone can enjoy. The Secret of the Carboard Rocket is considered a can’t miss for younger children. This show takes you on an outer space adventure to every planet in the solar system as kids learn their names and placement in our solar system. If your little ones are ages five and under, then there’s a separate play area located within Chabot that they can enjoy. The Discovery Lab is located next to the center’s café and provides a space where children can learn and explore through various toys. They could build a house out of giant Legos, pretend to blast off into space inside of a cardboard rocket, or color various images of the galaxy. Plus, this gives parents an excellent way to refuel as their children work out all of their excess energy. The location of Chabot is 10000 Skyline Boulevard in Oakland, California. Chabot is open Wednesdays through Sundays from 10 a.m. to 5 p.m., and parking is offered free in the adjacent lot. Adults will have to pay $18 to get in, each children’s ticket (ages 3-12) is $14, and children under the age of three receive free admission. To ensure that you skip some of the center’s busiest days of the year, you’ll want to call ahead. Schools often organize fieldtrips throughout the week, which can leave you and your children with little elbow room to move around and explore. Since the center is relatively small, you might be able to let your toddler walk around without the use of a stroller on less busy days. However, you might want one for when they are tuckered out after all of their adventuring. For a discounted ticket, look into the $5 Friday program. Chabot offers discounted tickets on the first Friday of ever month. You may also want o look into special events like telescope viewings, birthday parties, and summer camps. The Chabot Space and Science Center is an excellent place for children to learn about STEM and grow. Located in the walkable, vibrant neighborhood of Oakland, this science center is just a short distance away from the luxury apartments of Fourth Street East. Combining the excitement of downtown with the serenity of a waterfront neighborhood, Fourth Street East stands a premier destination in the Bay Area. Residents have immediate access to nearby freeways, the ferry terminal, and BART for simple commutes to San Francisco’s Financial District. The area itself is filled with premier shopping and fine dining experiences, but there’s more to a home than just the location. Spacious homes and luxurious finishes pair with carefully curated amenities to create one of a kind spaces within the city. The combined 330 homes feature private balconies that offer stunning views of the bay, a top mezzanine loft including private outdoor patios, and modern touches to every interior. Solid surface countertops and modern cabinetry highlight luxury appliances, while upgraded hardware and green technologies help to reduce your carbon footprint. The large hotel-style lobby lounge comfortably greets residents before heading to any of the on-site amenities. A state-of-the-art fitness center helps you stay in shape, while the club room and demonstration kitchen help you unwind. A game room and third floor courtyard complete with resort pool offer the ultimate in relaxation after a long day, while the bike center makes traversing Oakland an eco-friendly breeze. We invite you to experience Oakland like never before, with the finest in luxury accommodation the Bay Area has to offer. Welcome to a higher sense of living. Welcome to Fourth Street East.